Citation: Janko MR, Turner JT, Kashyap VS, et al.. Chronic type A aortic dissection with aortic valve preservation and staged endovascular repair. Ann Cardiovasc Thorac Surg. 2019;2(1):7-9. Chronic Stanford TAAD is an uncommon diagnosis and is more frequently associated with an aortic aneurysm and aortic valve insufficiency compared with acute TAAD . Repair options include partial or complete aortic arch replacement, prosthetic or allograft conduits, and variable reconstructions of the supra-aortic vessels [1,2]. Here we present the first report of a chronic symptomatic TAAD repair by native aortic valve preservation and staged endovascular repair. A 51-year-old man with a history of hypertension and severe chest pain three years prior to presentation was found to have a new cardiac murmur. Imaging revealed severe aortic insufficiency and a chronic-appearing TAAD from the aortic root (Figure 1A) to the iliac artery with associated 6.0 cm ascending aortic aneurysm and 7.8 cm proximal descending thoracic aortic aneurysm. The aortic valve was trileaflet. The coronary arteries were normally positioned and were perfused from the true aortic lumen. 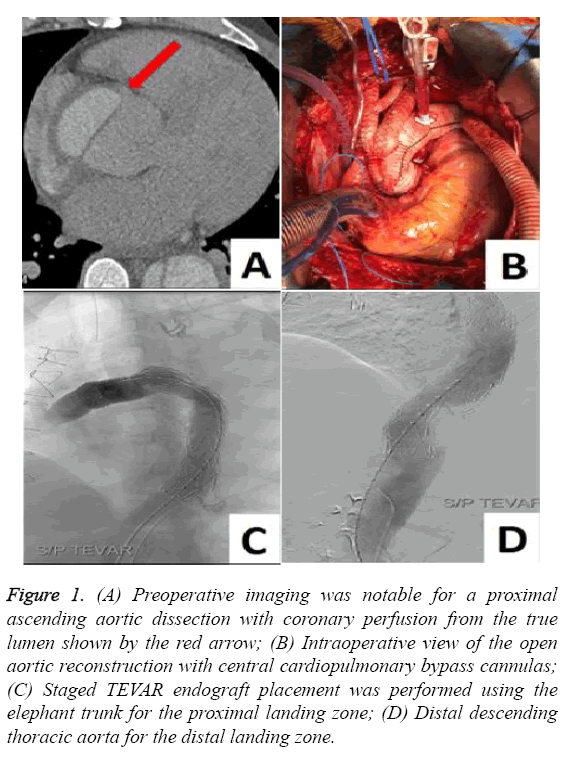 Figure 1: (A) Preoperative imaging was notable for a proximal ascending aortic dissection with coronary perfusion from the true lumen shown by the red arrow; (B) Intraoperative view of the open aortic reconstruction with central cardiopulmonary bypass cannulas; (C) Staged TEVAR endograft placement was performed using the elephant trunk for the proximal landing zone; (D) Distal descending thoracic aorta for the distal landing zone. An urgent operation proceeded with intraoperative measurement of the aortic annulus diameter at 2.3 cm and aortic sinus diameter of 4.9 cm. Cardiopulmonary bypass was via the right axillary artery and femoral vein. We performed an aortic valve-sparing aortic root replacement (David procedure) using a 30 mm Valsalva Gelweave graft (Vascutek, Scotland, UK) (Figure 1B). The core body temperature was cooled to a mean of 17ºC for deep hypothermic circulatory arrest and the aortic arch was reconstructed using a 24 mm Siena Gelweave graft (Vascutek, Scotland, UK). Debranching of the supraaortic vessels was completed using a bifurcated 20 × 10 × 10 mm Gelsoft graft (Vascutek, Scotland, UK) to the innominate artery and left subclavian artery in an end-to-end fashion. Similarly, an additional 6 mm graft was used for the left common carotid. A large fenestration at the site of the distal aortic anastomosis in the proximal descending thoracic aorta was repaired and a 30 mm elephant trunk graft placed. The aortic cross-clamp duration was 264 minutes and circulatory arrest duration was 83 minutes. Postoperatively there was no appreciable aortic valve insufficiency, though the patient developed atrial fibrillation. He was discharged from the hospital in good condition. Three months later the patient underwent Thoracic Endovascular Aortic Repair (TEVAR) via a transfemoral and transbrachial approach using Intravascular Ultrasound (IVUS) (Philips, Massachusetts, USA) to deliver two Medtronic Valiant Thoracic (MVT) 34 mm × 200 mm stent grafts (Medtronic, Minnesota, USA) (Figure 1C and 1D). An epidural spinal drainage catheter was placed for spinal ischemia protection and was removed on postoperative day two. The patient tolerated the procedures well without intraoperative or postoperative complication, and he was discharged from the hospital to his home. Postoperative computerized tomography revealed patent aortic reconstruction bypasses. Chronic TAAD is defined as dissection diagnosis for more than 30 days after symptom onset and is associated with lower mortality risk compared with acute TAAD . In-hospital death following repair of chronic TAAD is approximately onethird of acute TAAD repair (4% vs 13%), with commensurately superior five-year survival (80% vs 68%) . Multiple autogenous aortic valve reconstructive options have been developed including the David procedure . A metaanalysis of 4777 patients concluded that valve-sparing aortic root replacement for aortic root aneurysms was associated with 2% early mortality and 5% risk of reoperation . There was a trend toward higher reoperation in the setting of preoperative severe aortic insufficiency, and there is no appreciable mortality nor durability advantage between the David and alternative procedures. Aortic valve resuspension has also been described in the setting of acute TAAD with good long-term results . Hybrid repairs of TAAD involve an open proximal aortic repair and distal endovascular repair. A recent meta-analysis  classified the extent of arch reconstructions into four categories and reported overall in-hospital mortality, stroke, and spinal cord injury to be 5.7%, 5.7%, and 2%, respectively. Notably, the open total arch replacement technique with “warm” distal aortic elephant trunk placement off circulatory arrest did appear to have a trend toward lower neurological complications which may be due to staged TEVAR procedures. In contrast, the procedural variations on open arch replacement with simultaneous “frozen” elephant trunk TEVAR placement involve a stent graft deployed into the opened distal aortic arch during hypothermic circulatory arrest. These procedures in sum may have higher spinal cord complications, though this did not reach statistical significance in the meta-analysis. Interpretation of this data is tempered by limited sample sizes and the lack of prospective randomized data . We do strongly recommend the use of a prefabricated multibranched aortic conduit, which has decreased our circulatory arrest time from approximately 80 minutes to 16 minutes in subsequent cases. Type B descending thoracic aortic dissection and aneurysmal degeneration should be managed by TEVAR if technically feasible and procedural intervention is indicated. Fattori reported 571 patients with acute Type B aortic dissection and noted lower in-hospital complications (20% vs 40%) and lower in-hospital mortality (11% vs 34%) compared with open repair . Deep hypothermic circulatory arrest between 14ºC-20ºC has been shown to decrease metabolic demands during ischemic periods and decrease the subsequent risk of brain trauma . Cooling can be either goal temperature or Electroencephalogram (EEG) silence and is associated with a postoperative stroke rate of less than 5%. Spinal drain placement during TEVAR has also been shown to be neuroprotective and was applied in our patient using a drainage protocol similar to those described in the literature. Liu et al., have reported a successful one-stage hybrid operation that involved a David procedure and complete aortic debranching for acute TAAD . While this is an admirable accomplishment, we believe the single-stage approach may have a higher risk for spinal ischemia due to an inability to develop collateral perfusion. Spinal perfusion adjuncts for aortic procedures of this extent are highly recommended. Institutions with multi-disciplinary aortic centers improve outcomes by reducing time to definitive treatment and improving clinical throughput . In our aortic center, we conduct monthly conferences and semi-annual literature review events to foster a collaborative interdisciplinary environment. Successful management of complex chronic TAAD with aortic valve-sparing reconstruction, arch reconstruction, and staged TEVAR is a safe albeit complex surgical strategy that is best approached by expertise found in an aortic center. More research on the topic of chronic TAAD is needed. Rylski B, Milewski RK, Bavaria JE, et al. Outcomes of surgery for chronic Type A aortic dissection. Ann Thor Surg. 2015;99(1):88-93. Arabkhani B, Mookhoek A, Di Centa I, et al. Reported outcome after valve-sparing aortic root replacement for aortic root aneurysm: A systemic review and meta-analysis. Ann Thorac Surg. 2015;100(3):1126-31. Immer FF, Aeschimann R, Englberger L, et al. Resuspension of the aortic valve in acute Type A dissection: long-term results. J Heart Valve Dis. 2008;17(1):94-7. Yan TD, Bannon PG, Bavaria J, et al. Consensus on hypothermia in aortic arch surgery. Ann Thor Surg. 2013;2(2):163-68. Fattori R, Tsai TT, Myrmel T, et al. Complicated acute Type B Dissection: Is surgery still the best option? JACC 2008. J Am Coll Cardiol. 2008;1(4):395-02. Mariscalco G, Maselli D, Zanobini M, et al. Aortic centres should represent the standard of care for acute aortic syndrome. Eur J of Prev Card. 2018;25(15):3-14.